Witnessing first hand the problems in our current system of welfare payments, basic income has many attractions. But are the alleged pitfalls justified? 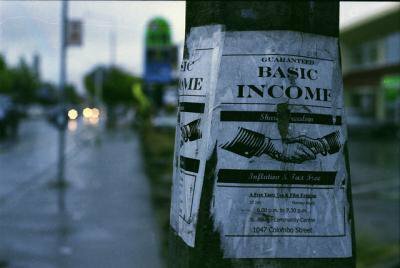 Few subjects are more contentious than the basic income. A means of securing basic rights for all, or of slimming a bloated welfare bureaucracy? A morally bankrupt denial of individual responsibility? It’s an idea with friends on all ends of political ideology. Contemplating the unproductive mess of poverty and low-skilled jobs that disfigures economy and human lives, I wonder what it may offer. For poverty is a terrible blight. I’ve been haunted lately by the memory of fear. ‘Memory’? Flash-backs to a time of fear stab sharper than mere memory. They were triggered by two frosty mornings, mysterious in their beauty, paralyzing in their impact on my knotted guts, my tightened throat, my obsessed brain. Why the fear? I’ve never been poor, but I have known the fear of cold, tensing the aching body and fogging the mind. I have struggled in desperation with a brain that cannot move. I have known the tired pain of longing for real, life-restoring food. I read of children unable to work at school. I think of people I’ve met who are trying and failing to manage. The struggle is relentless; it wears down energy and hope. I talk with a young woman about her budget. Tears come only once, fiercely banished. But she lives with fear: of checking her bank account lest it’s worse than she thinks, of the phone for dread of the creditors, of continued cold weather; and fear too that her landlord, struggling with his mortgage, will sell and make her homeless again. Two months’ notice, and she’ll have to go. Where will be affordable, whether she’s in work or out of it? Could Basic Income give this woman and her child a chance of productive, sustainable life? When people do take note that ordinary neighbours – not stereotypical feckless bums – routinely lack money for food or heat, they are usually shocked. For a moment. Cold and hunger are, like TB, primitive deprivations that we have expunged from the national myth. Being so alien, they are the more easily dismissed and forgotten again; they cannot be real. Yet deprivation will not go away. Un- and under-employment grow as mid-level jobs wither in face of computerized efficiency. Further erosion of benefits is in place for the coming years. Schemes like the newly-announced £2,000 childcare come and go, tinkering with the fundamental problems. What can we do? As I’ve written before the current benefit system isn’t fit for purpose and Universal Credit brings no fundamental change. I understand the insistence on a contract: benefits in exchange for fulfillment of responsibilities. I also see how such efficiency wars with fairness, for the stricter the conditionality and the slicker the computerisation, the further it travels from humane life. Increasingly, the focus shifts from relieving poverty to using the benefit system to punish those who fail to escape it. More precisely, it punishes those who fail in its central test: getting a job. Focusing on unemployment, the benefit system does not touch poverty itself. Within certain bounds, people must take whatever job offers, ensuring a pool of workers for the low-skilled, low-security, low-pay, poverty-bound jobs on which our economy too much depends. The urgent question remains: how to tackle poverty, in and out of work. That means many things, which include discouraging the growth of such jobs and encouraging people to train and make careful choice of the work they take. That young woman I met so badly needs sustainable work and a future. So I come back to basic income. The success last year of a Swiss campaign to trigger a referendum on its introduction helped highlight it again. Basic income has many variations: different approaches to non-citizens, to payment levels, to the point and speed at which it starts being taxed as income rises, and to funding. But common to them all is a payment to each person, sufficient to avoid (absolute or relative) poverty, irrespective of household, income, capital or other circumstances. Since the aim is always redistributive, the costs will bear heavier on richer people, but schemes are not necessarily funded primarily through direct or indirect taxes. Alaska’s annual Dividend, paid out of the Permanent Fund derived from oil revenue, shares the unconditional nature of a Basic Income. A financial transaction (‘Tobin’) tax is occasionally mentioned as a source of funding. Crucially, the cost of the scheme should not be dismissed as an addition to current public expenditure. That argument is so over-simplistic as to be meaningless. The evaluation and redistribution of costs and benefits would need broader calculation. How would a basic income answer my concerns? Might it make things worse? A key fear of its opponents is of a dossers’ charter: that having enough to live on, people would lose any incentive to work. Having seen the damage to people told they’d never work again between the 1970s and 2000s, I share that concern. Is it justified? There have been experiments with basic income schemes and their close relative, a negative income tax, since the last half of the last century. Most recently, Guy Standing has been working on a basic income scheme with villages in India; evidence there indicates the opposite. Given the security of enough to live on, people have become more economically active, particularly through self-employment. They have had money and the security enough to take risks. Local economies have benefited. Other studies, from the US and Canada in the last century, were more ambiguous. A small negative impact on people’s return to work appeared, women in particular being slower to return to paid jobs after childbearing. Researchers were struck though by the smallness of this effect: the fears of the naysayers were not fulfilled. It is not surprising that few people sat back and decided to live off the basic income alone. Work provides not only income: it gives structure to the day and social status; there’s no shortage of studies finding links between good mental health and employment. Given the chance, most people prefer to work. Given the chance? People have to be able to afford to take a job, given the potential loss of benefit, external costs and risks involved. Basic income is in a stronger position than UC to ensure that work always pays, since it goes to individuals not households so avoids the loss of incentive for second earners. Lacking the bureaucracy and stigma of means-tested benefits, its take-up is higher. As the Indian experience suggests, a basic income enables people to find or create work that would not have been possible from a position of destitution. The slower return to work in the US was a short-term outcome, a very narrow interpretation of the impact of the basic income. My interest is not primarily in how swiftly people return to paid employment, but in the longer-term impact on poverty, in terms of money and well-being. Tackling this age-old problem – and its national-economic costs – needs wider thinking. The studies in Canada and the US found increases in training and education take-up. Health improved. Similar findings emerged in the Indian study, affecting adults and children. In the long term, therefore, people receiving the basic income were in a stronger position to avoid poverty and costs to the public purse: better health and education spell better job prospects and national productivity. I’m not totally convinced by basic income. Such schemes typically pay a single sum to all individuals, usually irrespective of age. Paying individuals rather than households hugely simplifies administration and monitoring; it also advantages multi-person households over singletons, whose costs are higher. Perhaps more seriously, it ignores the higher living costs of disabled people and their greater risk of unemployment. The over-complexity of our current benefit system grew not least from its piecemeal recognition of these costs. I have hunted unavailingly for careful discussion of how vulnerable groups are to be supported by a universal scheme; I would fear that complex assessments of particular needs would gradually creep back. However, no one expects a magic wand. Whatever we do will involve difficulty and compromise, winners and losers. If we now had a system that did the job, we wouldn’t have to think again. But we don’t. We may ignore them, but the people of fear are among and beside us, and they’re not going away. Basic income wouldn’t fix that, any more than Universal Credit will. The task is to tackle not just the welfare system, but the shape of our dysfunctional economy. Yet basic income is an idea well meriting a place in the discussions that lie ahead. If you liked this piece, you can sign up for OurKingdom's weekly email roundup here, join our Facebook here or follow us on Twitter here.